Toulemonde Bochart works in close collaboration with their designers to create durable and reliable products. Their most innovative products bring an extra touch of spirit in an increasingly general offer. Convinced by their approach, they present products that will surprise you and entice you. This new collection reflects the work done in recent years that have responded to customers expectation and tastes. Hours are spent by designers to polish their creations, and work endlessly to renew their ancestral gestures in respect of the tradition that one can find this quest for accuracy which makes the quality of rugs. 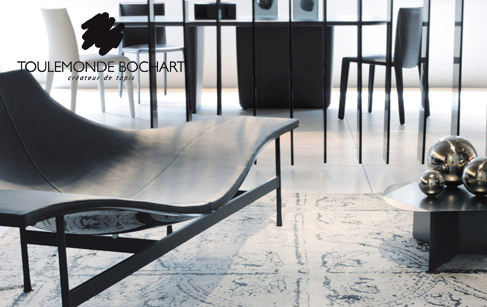 Toulemonde Bochart has worked closely with their production workshop for over 40 years, in a permanent exchange of tradition and modernity, movement and serenity, following or very often introducing new evolutions in the rug industry. This collaboration has always been conducted in mutual respect, and more and more towards environmental and social standards, at the heart of the development of a country like India that we see evolving with each one of our quarterly journeys.